We have dates available in the Lodge and Pete Smith Cabin for 2019. Call us for details. will be Saturday night September 21st, 2019. We will let you know when tickets go on sale! A meeting at Ranch A is memorable indeed. You may choose to use the historic lodge which was build by Finnish craftsmen to the specifications of Moses Annenberg in the 1930’s. 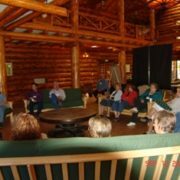 The lodge has a spacious meeting area, a kitchen with all the equipment to prepare great meals, and sleeping accommodations for 48. There are about 5 acres of mowed lawns and you may move part of your event outside to enjoy the fabulous scenery! And best of all, when you rent the Ranch A lodge you get the whole facility … no sharing with other groups. 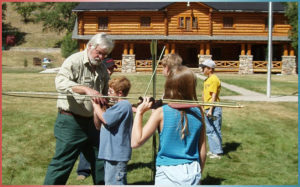 In addition to the Lodge, there is a smaller facility available to rent. 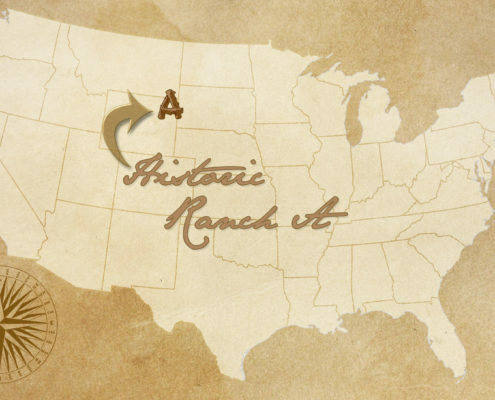 Named for a former owner and longtime supporter of Ranch A, the latest meeting and lodging facility at Ranch A is a conversion from the original garage and caretaker’s quarters. It was designed and built as a small replica of the Lodge. 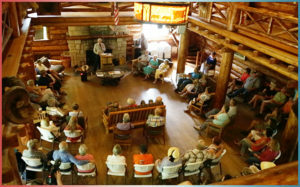 The Pete Smith Memorial Cabin has the capability of year-round usage and has an exceptionally large area for meetings, workshops, or demonstrations. The Lodge at Ranch A is available April 1st through November 15th (depending on weather). The Pete Smith Cabin may be available for use year round. Reservations may be made for an afternoon, a weekend, a week … or even a month. Call 307-643-3101 for information, availability, and to make reservations. 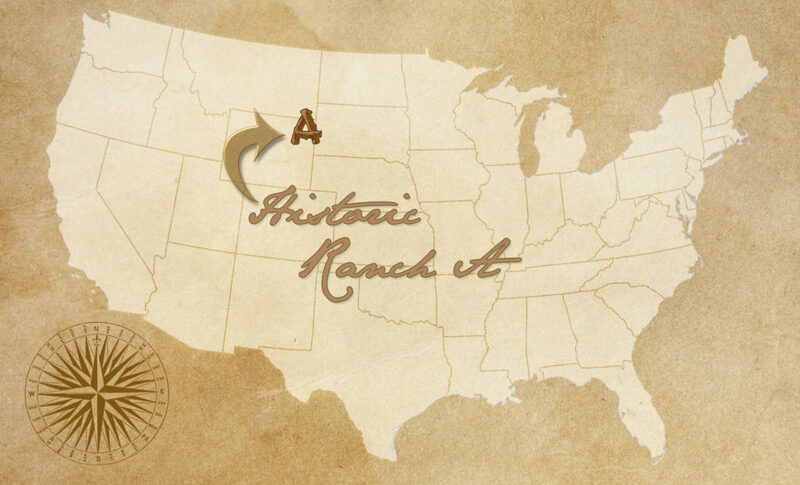 Historic Ranch A is the perfect place for your meeting, convention or retreat. 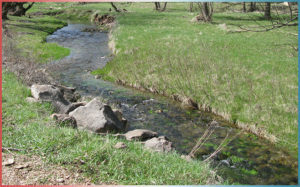 Nestled along Sand Creek in the beautiful Black Hills the peaceful setting is the perfect backdrop for your event. Founded by the famous Annenberg family our story spans the decades and includes media moguls, governors and winning race horses. We’ve also been a fisheries research and education center. During your stay you will have nearly endless options to explore. Enjoy the natural setting of our grounds, do a little fly fishing, hiking or wildlife watching from the Lodge’s welcoming front porch. The Ranch A Restoration Foundation maintains the ranch and provides a vision for its future. 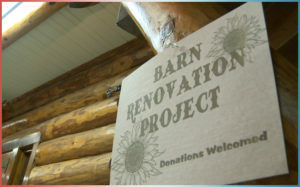 While the state of Wyoming owns the property providing for the needs of Ranch A is through charitable contributions. What a delightful time! We enjoyed during our stay at Ranch A. We hosted our 35th family reunion. The staff was marvelous and helpful and saw to our every need. We had time for hiking, fly fishing and especially catching up with family memories on the big front porch with the cool June breezes. Highly recommend this for your family gathering. 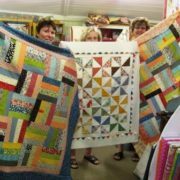 I was in charge of finding a suitable retreat for our quilter’s quarterly getaway. We had nothing but positive reviews from our members. There was room in the lodge for our quilting tables with suitable connections to accomodate our needs. And we enjoyed the great food and the peaceful strolls around the beautiful grounds at Ranch A. Thank you for an enjoyable outing. We’ll be back! 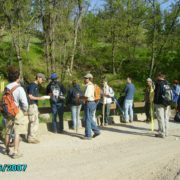 Once again Ranch A proved the perfect site to host our 5th annual geologic exploration field program from the SD School of Mines and Technology. Our students were provided with comfortable quarters, quiet study places and most of all the setting to explore and experience in a real-world setting what we’ve learned in the classroom. 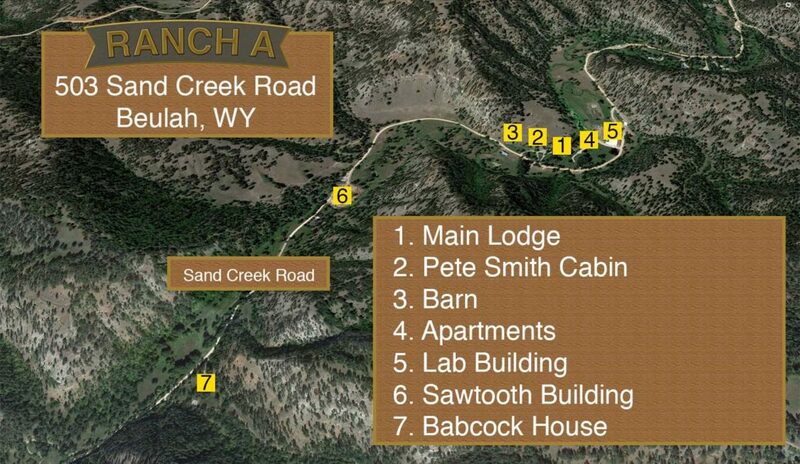 Ranch A is located in Northeast Wyoming along Interstate 90 five miles south of Exit 205. 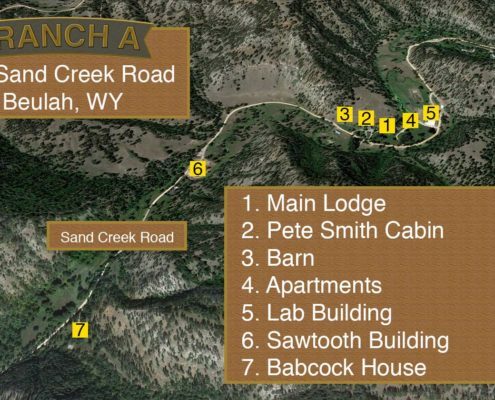 Ranch A is located in Northeast Wyoming just south of Beulah. We are 60 miles west of Rapid City, SD, on I-90. Take the Beulah exit, which is the first exit into Wyoming (Exit 205), and travel south 5 miles. You will go 5 miles on gravel and Ranch A will on your right hand side. From Gillette, Wyoming travel east 76 miles on I-90 and once again take Exit 205 and travel south. You will go 5 miles on gravel and Ranch A will on your right hand side.